In large bowl, stir sugar cookie mix, flour, melted butter and egg until soft dough forms. Press evenly in bottom of pan. Bake about 10 minutes or until just set. Transfer to cooling rack to cool slightly. Reduce oven temperature to 300°F. Meanwhile, in medium bowl, beat egg yolks, eggs and 1/2 cup sugar with whisk until thick. Beat in whipping cream and vanilla. Pour over cookie base in pan. Bake 50 minutes to 1 hour or until custard layer is just set. Cool completely on cooling rack, about 1 hour; cover and refrigerate 2 hours. Just before serving, sprinkle top of custard layer evenly with 1/3 cup sugar. Holding kitchen torch 3 to 4 inches from custard, caramelize sugar on custard by heating with torch about 2 minutes, moving flame continuously over sugar in circular motion. The sugar is partially melted at this point. Keep moving flame continuously over sugar in circular motion until sugar is melted and light golden brown. Let stand at room temperature about 1 minute or until caramelized sugar hardens before cutting into bars. Cut into 6 rows by 4 rows. 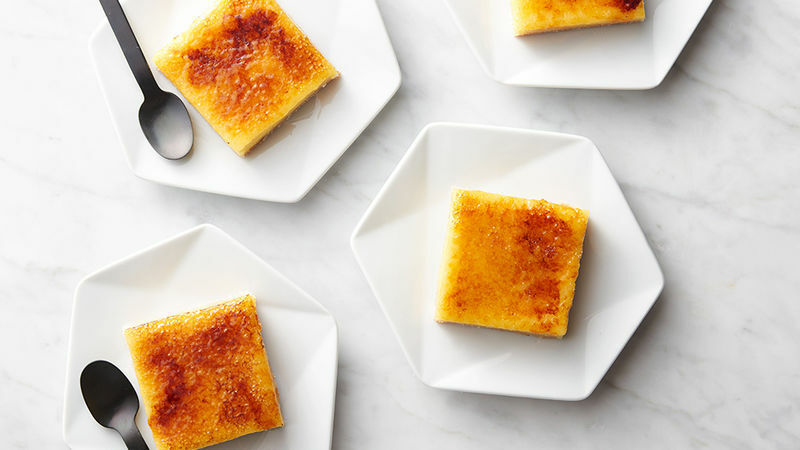 Bars are best served immediately after caramelizing sugar on top. For clean edges, cut bars with a clean, very sharp knife.